Colorless transparent crystals. Also known as magnesium sulfate. Magnesium sulfate most commonly employed in ceramics as a flocculant. It thickens and gels suspensions by electrostatically charging particles so that they attract each other more. This not only suspends them in the slurry but makes them stay put on non-porous surfaces (by virtue of the gelling mechanism). Even slurries containing no clay particles can be flocculated using this material. 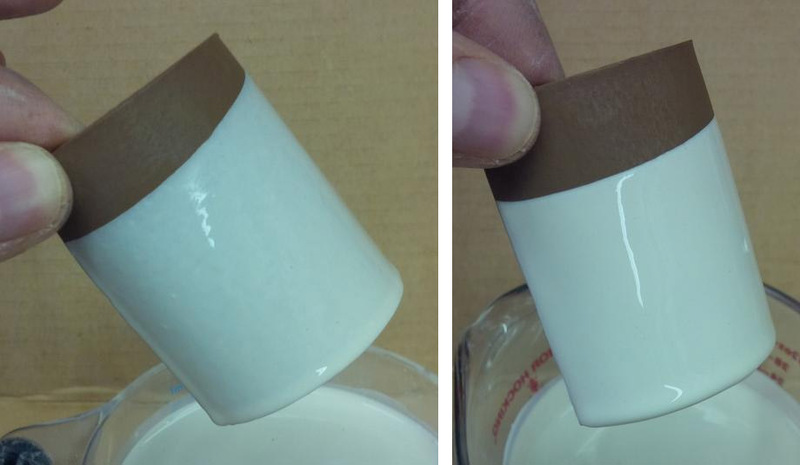 Epsom salts is generally better for flocculating ceramic glaze suspensions than vinegar (although less easily obtained). Calcium chloride is better than both (and the least easily obtained). The most effective use strategy is to make a saturated solution (30g dissolved in 100ml of water). If the crystals are added directly it takes time for them to dissolve and act and it is easy to overdo it and thicken the slurry too much (if you do not give the crystals time to dissolve). Notwithstanding this, if you have a good mixer that can run constantly, sprinkling in the powder and waiting thirty seconds for the reaction is not impractical for glazes (but not engobes). The addition of Epsom salts is commonly done with engobes. A gelled engobe will apply in a even coat and stay in place even though it takes time to dry. Without the epsom salt addition, it will run and drip (even with a low water content). It is better to add epsom salts as a saturated solution (rather than in powderized form) since the system is so sensitive to over-gelling if too much is added. Epsom salt additions are valuable for glazes also. 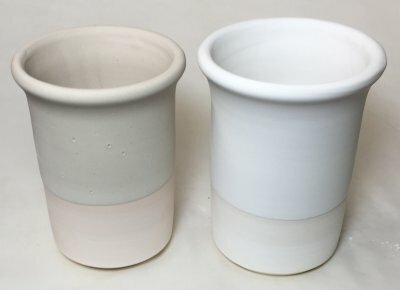 They enable creating a slurry that applies evenly, holds in place and goes on in the right thickness on porous or dense bisque ware. The thixotropic nature of the slurry gels it and holds it in place while drying. When the slurry has a sympathetic specific gravity 2g per gallon can gel it. Slurries containing CMC gum will not gel this way. Some clay body manufacturers add Epsom salts to their clay mixes to improve plasticity and stabilize bodies against the thixotropic and spontaneous softening effects of certain soluble compounds in the mix (e.g. soda feldspar, nepheline syenite). It is typical to use .2-.3%. 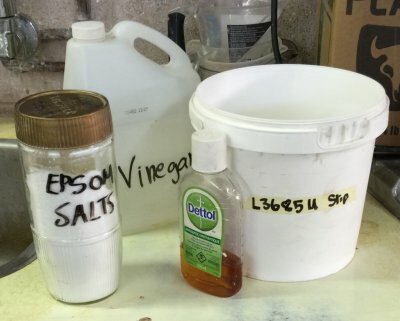 It is sometimes said that epsom salts can be a helpful addition to glazes containing Gerstley Borate to help prevent particle agglomeration of a slurry that causes it to gel (try about 4 g per 100g of Gerstley Borate). However, this is not our experience; Gerstley Borate gels slurries on its own (in fact it is famous for over-gelling them), deflocculation seems a more logical approach. Used to thicken glaze slurries. The same engobe. Same water content. What is the difference? The engobe on the left, even though it has a fairly low water content, is running off the leather hard clay, dripping and drying slowly. The one on the right has been flocculated with epsom salts (powdered), giving it thixotropy (ability to gel when not in motion but flow when in motion). Now there are no drips, there are no thin or thick sections. It gels after a few seconds and can be uprighted and set on the shelf for drying. Slurries with more clay (like engobes, slips) generally respond better to epsom salts. However the extra clay also makes them more likely to go moldy, so you may need to add a few drops of Dettol to kill the bacteria (if they are stored for any length of time). Vinegar works better for glaze surries, but only if they have sufficient specific gravity. 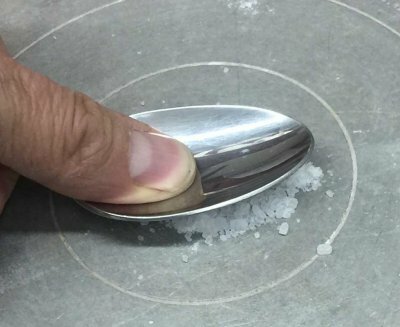 Many people like to make an epsom salts solution and add that, but if you have a good mixer you may find it more intuitive to add the crystals (which you should crush to a powder) and wait 30 seconds for the viscosity to respond. Feldspar applied as a glaze? Yes! The way I did it will change how you glaze. Custer feldspar and Nepheline Syenite. The coverage is perfectly even on both. No drips. Yet no clay is present. The secret? Epsom salts. I slurried the two powders in water until the flow was like heavy cream. I added more water to thin and started adding the epsom salts (powdered). After only a pinch or two they both gelled. Then I added more water and more epsom salts until they thickened again and gelled even better. They both applied beautifully to these porcelains. The gelled consistency prevented them settling in seconds to a hard layer on the bucket bottom. Could you do this with pure silica? Yes! The lesson: If these will suspend by gelling with epsom salts then any glaze will. You never need to tolerate settling or uneven coverage for single-layer dip-glazing again! Read the page "Thixotropy", it will change your life as a potter. While it is possible to make a saturated solution of epsom salts and water (about 30g per 100ml of water), sprinkling the dry material into glaze slurries is preferred by some. However epsom salts is a granular material so you need to crush it into a powder before using (so it will dissolve and act quickly).